We can’t always get away to a tropical destination, but you can create one at home. 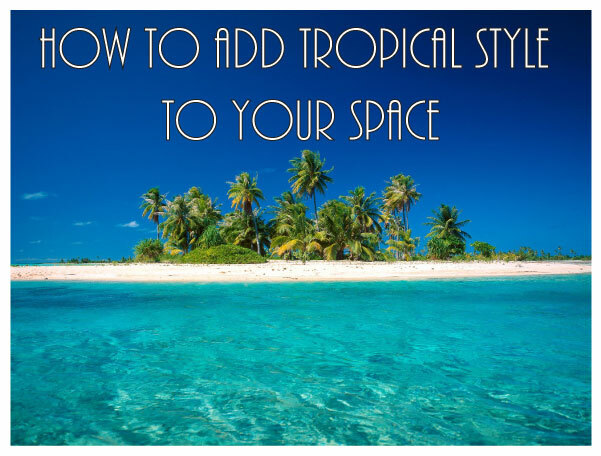 We are going to share with you a few tips to infuse your space with the vibe of the tropics without going overboard and having it look like you cleaned out the souvenir shop on your last island vacation. Here is how you can get the feeling of your favorite tropical destination in your own home. Start with the right inspiration. Think about the favorite tropical designation you have been or that list of island getaways on your dream vacation list. Really think about how those places look. The colors, the vibe, even the hotel you stayed in (or the fancy one you wish you could have stayed in). Look up pictures of the luxury resorts in your favorite place. These usually have a modern feel to them, but still capture the vibe of the location they are in without looking like a souvenir shop. Once you have narrowed down the feel of the destination you want to achieve in your space you can start to think about colors. There are a few ways to go when choosing your color palette for the space. If you plan to use a lot of bright pops of color in your accessories to pull from the colors found in gorgeous tropical flowers then keep your wall colors and furniture a more neutral tone. Another way to go would be to keep with all the neutral earth tones. The colors of the sand, shades of green foliage, etc. If you are looking for the calming effects of the sea choose different shades of blues and greens with hints of sandy beige colors for a very calming seaside effect. Once you have your color palette decided you will want to choose your furniture. Keep your furniture modern with clean lines and crisp, neutral fabrics for the main pieces. Items like your sofa can be accessorized with throw pillows in fabulous tropical prints that you can switch out when the mood strikes and you want to change the feeling of the space. Choose a few accent pieces with a tropical flair, such as bamboo furniture or something with a Polynesian vibe to it. This way you are capturing the feeling without going overboard with bamboo everything. Once all of your main pieces are in place it is time to add art and accessories. Be unique with these and don’t add what you would first think of for tropical décor. Stay away from things covered in seashells and Hawaiian print fabrics. Opt for more modern details like large palm leaf prints and gorgeous tropical floral arrangements. Mix woods and metals in your accessories and add pops of tropical colors. For the art, think of art that is actually made in a tropical location, things that artisans from the islands create. Stay away from anything you would see in a souvenir shop to keep it as a more realistic island vibe.